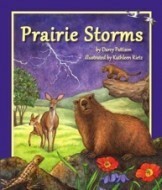 Cozy up for a rainy day read and explore the prairie ecosystem through its ever-changing weather. Each month features a storm typical of that season and a prairie animal who must shelter, hide, escape, or endure those storms. Told in lyrical prose, this story is a celebration of the grasslands that dominate the center of American lands and the animals that live there. Darcy Pattison has taken the 12 months of the year and shown the cycle of life on the prairie, as well as the weather cycle. She didn't stop there. She has filled the end of her book with lessons and activities that covers habitats, math, science, geography, reading. She provides online activities and resources and for those of us who are teachers, this book is geared to state standards. I look forward to putting this on the shelf for my grandkids and recommending it to the parents of my students who have little ones at home. For more information about Darcy, visit her website at www.darcypattison.com. Visit Kathleen’s website at www.kathleenrietz.com. Go to Prairie Storm's home page at http://www.SylvanDellPublishing.com to check out the cross curricular activities and quizzes for this book.